Cycle Fun Montreal: MRC Maskinongé ride turns out great! 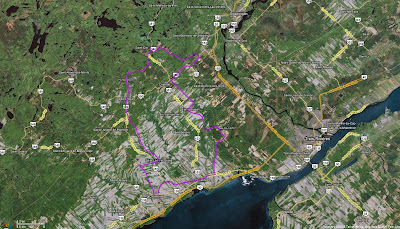 Our anticipated ride in the region just west of Trois Rivieres called the MRC Maskinongé was a great one. Beautiful weather, good road conditions, good weather, nice distance and scenery. What more could you want from a ride than this? Not much, this is a beautiful region, and this ride took us through a lot of it. As a bonus, our average speed was 25 km/h at the end of the ride. Woohoo! A slightly edited Bikely map is in progress, it'll be up in a day. This was a nice ride and we recommend it.